Sugar makes it easy for you to track customer emails, manage appointments and keep your calendars in sync. Be more productive and focus on what matters most - your customers. Sugar’s email and calendar integration streamlines common tasks and promotes effective communication between your users and customers. View your customer emails in Accounts, Contacts, Leads, Opportunities, or Cases modules. Use the Sugar Email Archiving feature to automatically save all your customer communications like emails and meetings to Contact records. Avoid losing key customer emails, attachments, or calendar events. Leverage out-of-the-box Sugar Plug-Ins for Microsoft Outlook and Lotus Notes. Integrate your CRM data with your email clients. With a few clicks, Sugar users can sync emails, contacts and calendar information into Sugar modules. 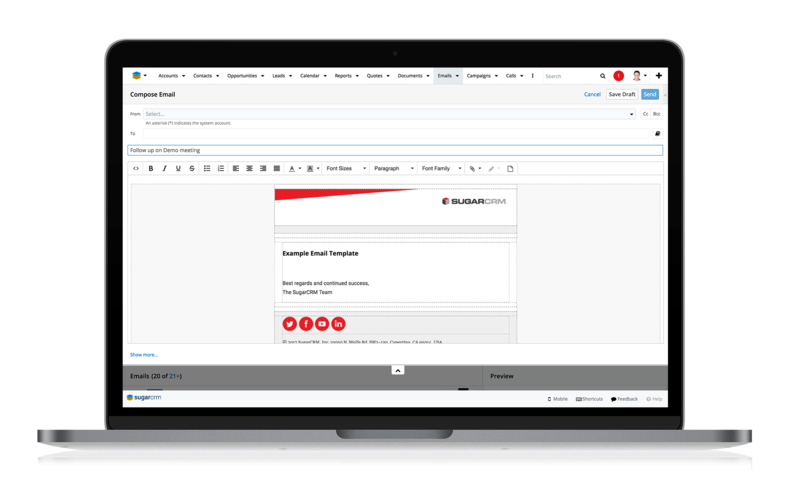 Capture important customer communications within Sugar and archive emails directly from the Outlook and Lotus Notes email clients into Sugar. Sugar's Calendar module allows users to easily schedule, view, and manage their activities like calls, meetings and tasks, all in one place. Easily keep track of all your customer meetings and view their history in various Module including Contacts, Opportunities or Cases. Drag and drop appointments into the Calendar Module from popular email applications. Use Sugar Email client to complement your existing email clients or as a full replacement. Sugar Email Client features tight integration with all Sugar modules. Sugar Email Client is interoperable with leading email servers. Sugar Email Client works with leading email services such as Microsoft Exchange and Gmail.